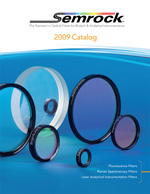 ROCHESTER, N.Y. - Semrock announces the release of its new 72-page, full-color 2009 optical filter catalog. This latest catalog presents highly informative Technical and Product notes along with three new product families and dozens of new optical filter products optimized for applications and tools ranging from fluorescence microscopy and instrumentation to Raman spectroscopy and other laser analytical instrumentation. The 2009 catalog features many new products that further enhance Semrock's already extensive range of "no burn-out" BrightLine® fluorescence filters, including high-performance microscopy filter sets for the popular mCherry fluorescent protein and ICG. The new LaserMUX™ dichroic beamsplitters efficiently combine or separate up to six of the most popular lasers used for fluorescence excitation (and other laser-based applications). New long-wave-pass fluorescence filter sets are specifically designed for laser-based microscopy where the fluorescence signal levels are very low, as well as enabling applications where the excitation wavelength is well below the emission wavelength. The 2009 catalog also highlights the latest additions to Semrock's renowned StopLine® notch filters, featuring ultrawide passbands combined with simultaneous deep and narrow laser-line blocking. Unheard of previously in a thin-film notch filter made with multiple, dis­crete layers, these new patent-pending notch filters attenuate the laser wavelength with optical density (OD) > 6 while passing light from the UV well into the near-infrared (1600 nm). They are especially suited for optical systems addressing multiple regions of the optical spectrum (e.g., UV, Visible, and Near-IR), and for systems based on multiple detection modes (e.g., fluorescence, Raman spectroscopy, laser-induced breakdown spectroscopy, etc.). Expanded services included in the catalog are Semrock's rapid custom-sizing in under a week, and 30-day return policy. Most of Semrock standard catalog products ship the next business day, and all are covered under the company's industry-leading five-year warranty. Request your new print catalog today. Semrock, a Unit of IDEX Corporation, manufactures a wide range of quality optical filters that set the standard in performance and reliability for the biotech and analytical instrumentation industries. All Semrock optical filters are made with hard Ion Beam Sputtered optical coatings. OEM filters are manufactured in volume. End-users benefit from a wide selection of standard catalog products that ship from stock. Semrock's patented and patent-pending products include the highly acclaimed BrightLine series of fluorescence filters for research and clinical microscopy, high-throughput screening, real-time PCR, and other fluorescence-based instrumentation; state-of-the-art filters for Raman spectroscopy; and other unique laser analytical instrumentation filters. Semrock's innovative products, made possible by combining modern ion-beam sputtering with Semrock's proprietary volume manufacturing technology, are covered under an industry-leading five-year warranty. Founded in September 2000, Semrock is based in, Rochester, New York, a well-known center of optics, and has sales offices throughout the United States. In October 2008 Semrock became a unit of the Health and Science Group of IDEX Corporation. For additional information about Semrock, its products, and its team of international distributors, visit the company website at www.semrock.com. Semrock, BrightLine, and StopLine are registered trademarks of Semrock, a Unit of IDEX Corporation.